Many insect pests feed on cereal crops and canola. But for every pest in the field, there are dozens of predators feeding on them. Knowing which beneficial insects feed on the major pests can help growers make better management decisions. University of Toronto postdoctoral entomologist Vincent Hervet explains. The cereal leaf beetle is an invasive insect from Europe that feeds on cereal crops, including wheat, barley and oats. It was first introduced to Alberta in 2005, in Saskatchewan in 2008 and in Manitoba in 2009. Cereal leaf beetle shows a preference for cereals and grasses, specifically oats, barley, wheat, rye, timothy and fescue. According to Alberta Agriculture and Forestry, crop yield and quality are impacted for the most part by a loss of photosynthetic activity from feeding damage. Both adults and larvae feed on plant leaves and chew long strips of tissue between the leaf veins. There are several species of beneficial insects that either attack the eggs or the larvae of the cereal leaf beetle. Tetrastichus julis, a parasitoid wasp whose larvae develop within cereal leaf beetle larvae, for instance, can kill a substantial number of cereal leaf beetle larvae, said Hervet. Outbreaks are most likely to occur where the beetle has been recently introduced. This may be because parasitoid populations have not yet established. Hervet said that it’s best to avoid spraying if possible until the parasitoid is well established. Leaving untreated refuges in the field will provide a place for the wasp to establish a population. Currently, all wheat varieties are susceptible to wheat midge; some are more susceptible than others. Infestations can not only reduce yield, but also lower the grade of harvested grain. While the wheat midge has four growth stages — pupa, adults, eggs and larvae — the larvae are the stage damaging the crops. After hatching, wheat midge larvae feed on developing kernels, which causes it to shrink and crack. On the outside, the kernel will look healthy and normal, which makes damage difficult to detect. In fact, damage can only be detected by inspecting the developing seed within the glumes. Damage varies from kernel to kernel and can impact both yield and grade. According to Hervet, wheat midge is often kept in check by an egg-larval parasitoid called Macroglenes penetrans. The problem, though, is that parasitoids need a few years to establish, so areas recently colonized by wheat midges might not be controlled by parasitoids yet. avoid wheat-on-wheat rotations. “Wheat-on-wheat rotations are definitely the worst for wheat midge because their cocoons can remain alive for several years in the soil,” said Hervet. If conditions are not suitable one season, as in it’s too dry, most cocoons won’t hatch and remain alive in the soil. If the next year is dry again, most cocoons won’t hatch, therefore postponing the peak emergence to another year. Only spray when the pest has reached economic thresholds, said Hervet — spraying will take out beneficial insects as well. Hervet also suggests leaving an untouched patch of land near the field, like field margins, to allow flowers to develop where parasitoids can flourish. Parasitoids need a source of nectar to survive. Without food they can survive for two days, but with food they can survive for a month. Like diamondback moth, alfalfa looper is blown into Canada from the U.S., although some may actually overwinter here. The alfalfa looper is a pest of canola. There are usually two overlapping generations of alfalfa looper, which means the pest can appear all summer long. The adults feed on flower nectar at dusk and fly during the daylight hours. Adults lay up to 150 to 200 yellow, hemispherical eggs either on their own or in clusters. Larvae will hatch in around seven days, climb into the flower head of canola, and cut off flowers and seedpods. Mature larvae tie leaves together with silk and spin cocoons in which to pupate. If you see what looks like a half-inch ball of yellow cotton at the top of the plant, you’ve spotted parasitoid cocoons. Once an adult, the tiny Cotesia yakutatensis wasp will sting the host, inject eggs inside, and when the eggs hatch, they will feed on the alfalfa looper larvae. 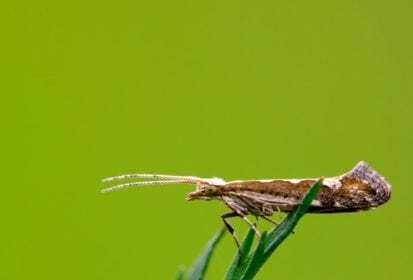 Diamondback moth is common throughout North America, living wherever its host plants do. In Western Canada, the primary targets of diamondback moth larvae are mustard and canola. Infestations vary from year to year. In southern Alberta, some years nearly 100 per cent of diamondback moth is controlled by a parasitoid, although this was certainly not the case last year, said Hervet. Diolcogaster claritibia, a parasitoid of diamondback moth, occurs mainly in southern Alberta. “When we surveyed it in 2011, we found that nearly 100 per cent of diamondback moth were controlled by this parasitoid,” said Hervet. Diolcogaster claritibia is new to North America, said Hervet, who said it just appeared on its own a few years ago. The cocoons of the parasitoid are visible in the field. The tiny cocoons are about two mm in length and bright white, said Hervet, and will be visible on the canola leaves themselves.